Science Proves that Beer Goggles Are Real, But Are They Really So Bad? Bad news, frat boys. (Or good news? I'm not sure.) It turns out, according to a new study, that "beer goggles"—that thing where you get wasted and then you accidentally think that ugly people are hot and then you wake up the next day like, "GROSS! A MONSTER!" because you are inherently better and more valuable than anyone less conventionally attractive than you—is a real, verifiable phenomenon. Cool story, I guess. Researchers from the University of Bristol decided to test whether alcohol really does give a rose-colored tint to people you want to make out with. While make-outs through history have indeed indicated this, now there is an official legit study from real science to cite. 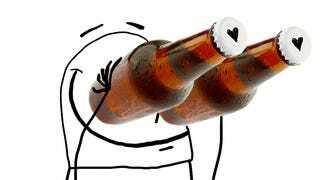 Beer goggles: They do exist. However did diligent scientists prove such a thing? Well, volunteers drank either an alcoholic beverage or an ersatz-booze-placebo-beverage. Then, they all looked at images of 20 female faces, 20 male faces, and 20 landscape portraits. People who drank alcohol rated all the image types higher. I LOVE that it also works on landscapes. YOU WILL BE HEARING FROM ME LATER, COW PASTURE WITH A FALLING DOWN BARN. My suspicion—based on my experience as a human being with eyeballs who has occasionally ingested beer and then looked at other people's buns and faces in a sexual way—isn't that alcohol actively causes us to be attracted to people we otherwise wouldn't. It's that alcohol lowers some of the culturally-imposed inhibitions that limit who we're "supposed" to find attractive. Personally, I only get more honest when I'm drunk—not less. When you're drunk, it's easier to get over the little voices that tell you you "shouldn't" like this person because they don't "match" what you think you "deserve." Or they wouldn't sufficiently impress your bros. Or to overlook "flaws" because, sure, you just want to get laid. If you think about it, beer goggles are really more like INNER BEAUTY GOGGLES. If you're so threatened by "beer goggles," and what you chose to do while wearing them, then you might benefit from some beer-introspection.